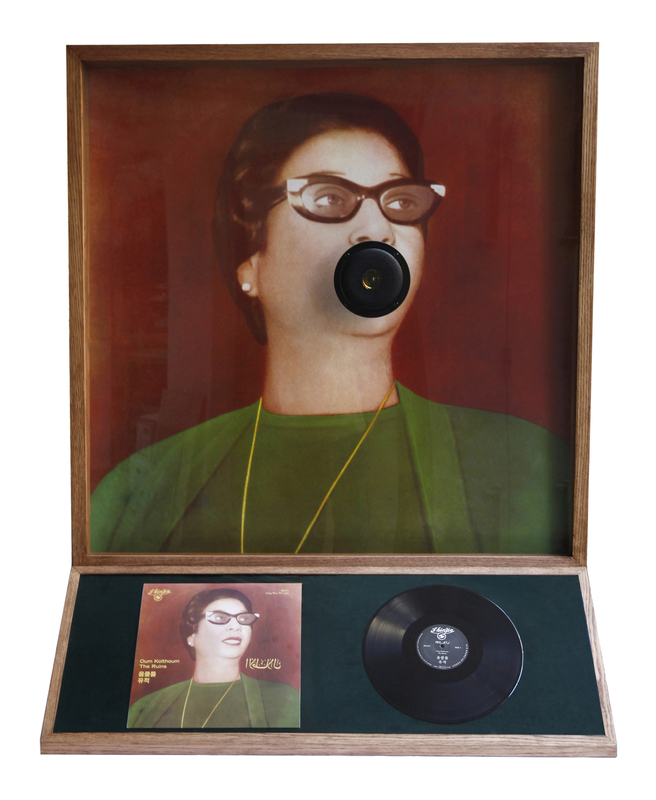 The work of Lebanese multimedia artist Raed Yassin relates to mass media, pop culture, urban life and history – themes that he explores in his first solo exhibition in the UK. In Kissing Amnesia, Yassin presents works from the ongoing ‘Yassin Dynasty’ (2013) series (a project that is derivative of his 2012 work ‘China’, which was made possible through the support of the Abraaj Group Art Prize), along with the mixed media installation ‘Ruins in Space’ and embroidered works from the ‘Dancing, Smoking, Kissing’ series. 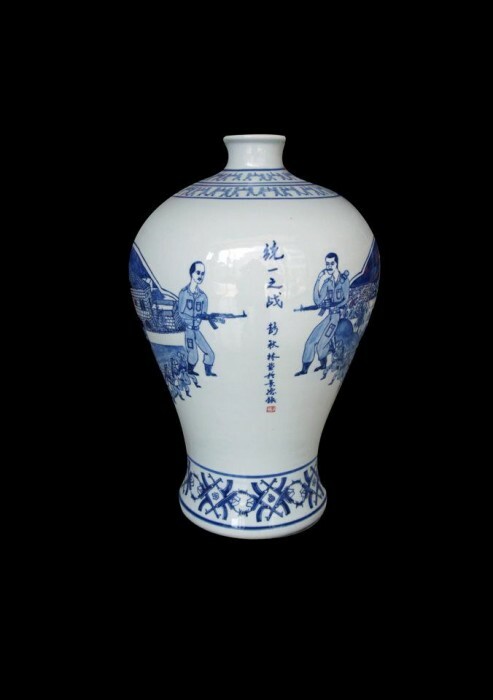 ‘Yassin Dynasty’ consists of a series of porcelain works depicting several battles from the Lebanese civil war (1975-1990) produced in Jingdezhen, the capital of porcelain production in China. The works are part beautiful object, part historical document and part mass-produced product. They echo the ancient tradition of recording victories at battle on vases and ceramics for the sake of posterity. The works also embody the image of a Chinese decorative readymade object that could possibly be found in any Lebanese home. This merging of traditional, historical and artisanal elements creates a conceptually complex and multi-layered work, and is also found in ‘Dancing, Smoking, Kissing’. In the words of curator and critic Nat Muller, “He takes the viewer on a pictorial walk down memory lane by threading together the mental images of his childhood with their disappeared photographic representations. 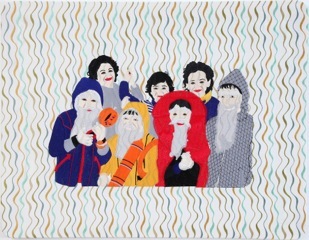 “[…] Born into a family of tailors Yassin sets out to reconstruct these disappeared and abandoned images on computer-embroidered textiles that incorporate his own recollection, those of family members, and the leaps and gaps of his imagination. “Colorful, intimate and ornamental these embroideries simultaneously emit a sensibility of domesticity while also retaining a mass-produced and mechanised feel, which to an extent dilutes the highly personal element of the project”. ‘Ruins in Space’ presents a fictional narrative based on actual material that lends it realistic potential. It revolves around two legendary divas from very different parts of the world, Oum Kulthoum (Egypt) and Lee Nan-Young (Korea). Raed Yassin lives and works in Beirut, Lebanon, where he was born in 1979. He graduated from the Theatre Department of the Institute of Fine Arts in Beirut in 2003 and has exhibited and performed his work in numerous museums, festivals and venues, including Akademie der Künste der Welt (solo show), Scatola Bianca, Milan (2015), Stedelijk Museum, Kunsthalle Wien, ICA, London, Gwangju Museum of Art, Castello Di Rivoli, Turin (2014), The Running Horse, Beirut; Boghossian Foundation – Villa Empain, Brussels, 4th Thessaloniki Biennale of Contemporary Art, Singapore Art Museum, Mori Art Museum, Tokyo, Beirut Art Center (2013), New Museum, New York (2012), Kalfayan Galleries, Athens (2014 & 2011), Museum of Photography, Thessaloniki, Sharjah Biennial 10, Centre Georges Pompidou, Paris (2011); Delfina Foundation, London (residency 2014 & 2010-2011) and Manifesta 8, Murcia (2010). His awards and grants include Research Fellowship, Akademie der Künste der Welt (May-June 2015), Cologne, Sharjah Art Foundation Project Fund (2014), Abraaj Group Art Prize (2012), Fidus Prize (2009), AFAC grant for production (2010), YATF grant for production (2008 & 2012) and the Cultural Resource grant for production (2008). Yassin is one of the organizers of IRTIJAL Festival, has released 14 albums of music and founded the production company Annihaya in 2009. He is also a founding member of ‘Atfal Ahdath’, a Beirut based art collective. Kissing Amnesia is at Leighton House Museum Monday 13 July – Sunday 2 August 2015 and Raed Yassin is in concert at Leighton House Museum on Monday 13 July 2015.